Travel Tuesday trivia question: Did you know water could glow in the dark? Experience it for yourself with a night-time trip to Glistening Waters Restaurant and Luminous Lagoon in Falmouth, Trelawny. The lagoon has fascinated both travellers and scientists alike, as people from all over the world flock to area to see the ‘glistening waters’ in action. At night, the calm, brackish water gives off a glow whenever it is agitated, taking the shape of the item that disturbs it. 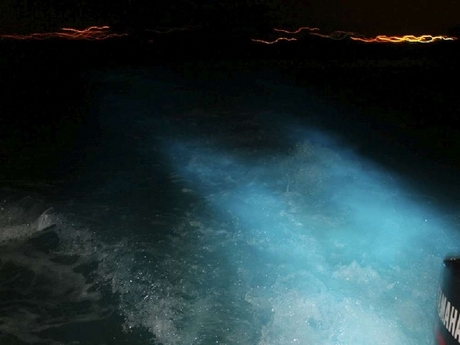 Imagine jumping in for a swim and seeing your body outlined in the cool, blue glow! It is certainly a one-of-a-kind experience. On a rainy night, there is nothing more beautiful than to see the glow of every drop that hits the water. This phosphorescence or bioluminescence is caused by the presence of microscopic organisms called dinoflagellates. These organisms thrive in areas where there is a delicate mix of salt and fresh water. Read more about it here. Nightly boat tours begin at sunset, departing from the Glistening Waters Marina. Visit the the website for booking information.